Once again, the Fireball crossword is a contest. The review will be posted once the contest deadline has passed. 19a, ? OF THE SEA [StarKist competitor] crossing 1a, OFF-? [Where all-terrain vehicles go]. Going across, the 19-box contains CHICKEN; going down, it contains ROAD. It’s almost as if… the chicken is crossing the road. I couldn’t find a satisfying way to represent that in my screenshot, so just know that everywhere you see a ROAD square in the above grid, that goes with the down answer, and the square should also contain a CHICKEN for the across answer. 35a, PLAY ? [Risk mutual destruction] crossing 36d, ? RUNNER [Noted Warner Bros. toon]. 39a, ? WIRE [Coop material] crossing 15d, ? ACCESS [Highway adjacent to a throughway]. 60a, NO SPRING ? [Person getting up there in years] crossing 63d, ? MAP [Plan for achieving a long-term goal]. I think it’s also fair to say that there’s either a very clever bonus in this puzzle or a fortuitous bit of construction. The most common answer to the joke “Why did the chicken cross the road?” is “To get to the other side.” The ROAD-crossing CHICKEN squares in this puzzle start at the left edge of the grid and progress down and to the right, ending on the right edge of the grid. So in a way, the CHICKEN crossing the ROAD does, in fact, get to the other side of the grid. This is a very nice construction, especially for that reason, but also because of the consistency of having all the CHICKENs go across, and all the ROADs go down. I don’t think the theme constricts the grid too much (especially since the revealer is only three letters long), but it was probably wise to use a 78-word grid anyway. The resulting fill is pretty clean.There’s not a lot of long stuff to marvel at (PENPALS? BAR EXAM? POLO BALL? ), but there’s even less to nitpick, which is ideal for a Thursday. Well, at least not until I had BA?ESAM and couldn’t figure out what could complete that letter pattern. It took me about 15-20 seconds to untangle that mess; otherwise, this could have been a record-setting Thursday for me. Cheeky bit of cluing for what was probably the ugliest bit of fill in the grid: 53d, DOR [“Le Coq ___”]. Le coq d’or is an opera by Rimsky-Korsakov about a golden rooster! I don’t think any of the crossing entries were roads, though. 4.2 stars from me. Until next week! Second of all, it appears we have a genuine debut on our hands. 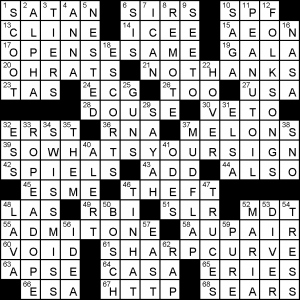 I could find no reference to the constructor in any of the usual crossword databases, and I did stumble across a personal blog of a Greg Poulos who at one point stated he was busy “writing crossword puzzles that get rejected by the New York Times.” Well, if this is the same Greg Poulos, good job getting published. This makes for an impressive debut. So what’s going on thematically? We have four clues all using the same words but with slight differences in punctuation and capitalization. And all the entries are crossing grid-spanners! Zoinks! 17a [“It is what it is”] NO USE PROTESTING. Hmm. I normally hear “no use complaining,” but that’s one letter too long. 5d [It is what “It” is] STEPHEN KING BOOK. You know they’re doing another film adaptation of this? It‘ll be released in September. 10d [It is what it is] ANSWER TO TEN DOWN. Cheeky! 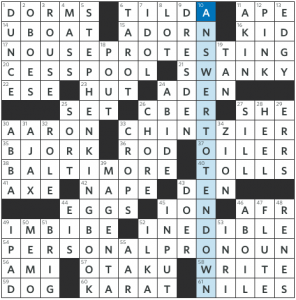 I uncovered the Stephen King entry first, and while I’m generally not a fan of puzzles that use clue-type entries (i.e. entries that look like clues), I found a certain charm to the puzzle, so I was willing to overlook this issue. Finding four grid-spanners that satisfy the clues is impressive enough, but having them all cross is nothing short of remarkable. Very well done! As for the tautology? I suppose it’s referring to the fact that the clues are repetitive, though the answers have different words, obviously. With the four main theme entries crossing, they place heavy constraints on the grid, and so there is some questionable fill. I’ll get to that in a bit, but there are quite a few sparkly entries like CESSPOOL, CHINTZIER, BALTIMORE, MAGENTA, SWANKY, and DRESDEN. As for the rougher stuff, the crosswordese count is high with the likes of ESE, ADEN, CBER, AFR, AMI, EIS, INRI, and AAR. But nothing is rougher than ILKA [Chase in the movies] crossing OTAKU [Obsessive anime fan]. ILKA Chase was an actress who was active from the ’20s to the ’70s. I’m guessing anyone under, say, 40, won’t have heard of her (except maybe from crosswords). I’m older than 40 and hadn’t heard of her (even from crosswords). And if you didn’t know the Japanese word OTAKU, you were probably pretty well stuck at that crossing trying to find an alternative to ILSA/OTASU. 4d [One side of a relativity equation]. MASS. If this is referring to E=mc2, there’s more than MASS on the right side. Sure, it can be solved for m, but that’s not how it’s usually written. If this referring to a different equation, I’d be happy to learn it. 42a [Chignon spot]. NAPE. Didn’t know what a chignon was. 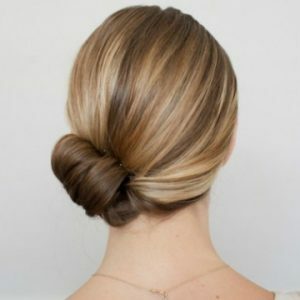 The internet tells me it’s a “knot or coil of hair arranged on the back of a woman’s head.” Does it really have to be a woman’s head? 1d [One who’s been cornered?]. DUNCE. 45a [Part of a solution, perhaps]. ION. 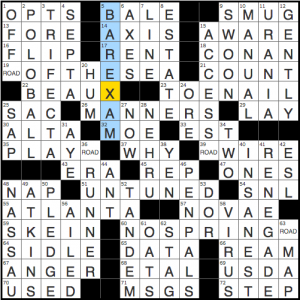 Overall, I was quite taken with the theme and enjoyed parsing and re-parsing the clue until I came across the solution. The fill might be rough in spots, but it’s definitely do-able, and there’s plenty to like here. Again, this was pleasant enough, but there are some phonetic backflips in changing things to A-sounds that my brain just can’t complete. London Broil -> LONDON BRAILLE doesn’t quite fully switch over, nor do a few others. The first themer I came to was OPENSESAME. The clueing [Words requesting a pass] felt a little clunky. Turns out the reason was thematic. All the theme answers have clues revolving around different meanings of “a pass”. This is a very creative theme concept, and mostly executed tightly. The rest of the clues were a lot smoother despite the constraints. The “SO” part of SOWHATSYOURSIGN did feel like padding, but that’s the only other real quibble. To summarise: OPENSESAME is a passphrase, NOTHANKS refers to passing as in refusing, SOWHATSYOURSIGN is making a pass, ADMITONE is found on a concert pass or similar, SHARPCURVE I presume is a sign seen on US passes; here we use arrows. It’s a dense grid, but carefully designed in terms of both theme answer and black square placement. This is a subtle thing, but I’d say it’s one of the reasons Ms. Burnikel is probably the best grid filler of any LAT regular… The big corners span two themers and still she fit in PEANUTOIL, ROPEADOPE and SWISSMISS, which would all shine as answers in a themeless puzzle. Fun fact re MELONS – [Cantaloupe and honeydew]… Cantaloupe in South Africa is called spanspek, which means Spanish bacon. This entry was posted in Daily Puzzles and tagged Brendan Emmett Quigley, C.C. Burnikel, Greg Poulos, Jacob Stulberg. Bookmark the permalink. NYT: BALE / AXES was annoying. Surprised the AXIS/AXES crossing was okayed. Similar entries are not considered a problem (at least by this editor) if their etymologies are different. Axis can be traced (through Latin and Greek) to Sanskrit. Ax is an unrelated word with Germanic roots. In fact, some might consider crossing two such “disparately similar” words a form of sparkle. Huh, I did not know either that the AXIS and AXE had different roots, or that crossing them would be okay. Guess if you learn something (two things!) from it, it’s probably a good cross. Thanks Martin. In logic, a tautology is a statement that is true regardless of the context. “If it’s raining, then it’s raining” and “I’m drinking tea, or I’m not drinking tea” are examples, as is “All floogles are bizzits, or some floogle is not a bizzit”. So “it is what it is” is another example. By necessity, tautologies do tend to be repetitive, but it’s not really their defining trait. 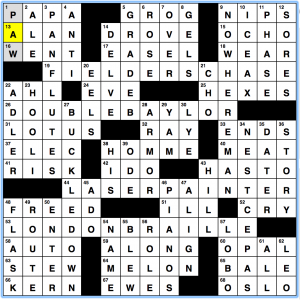 And while I’m here, Patrick Berry’s Fireball crossword is my pick for Crossword of the Year. I didn’t know that King book, so that was my last theme entry to fall. Indeed, after getting 10D, I was rather hoping, in line with the title, that the theme would all be self-referential. But it’s fine enough as it is. The crossing of OTAKU (new to me) and ILKA Chase (forgotten) was hard for me, and I had “pet” for DOG, but (not to rub the theme in still further) so it goes. The rhetorical sense of “tautology” (as intended by the title) predates the logic sense by several centuries. While the meaning of “redundant phrasing” is cited from the 16th century, the sense from propositional logic was coined by Wittgenstein in 1921. Wittgenstein’s early tautological “Whereof we cannot speak, thereof we must pass over in silence” is among the most beautiful sentences ever. Truly enjoyed this one, loved the theme and perhaps even more the crossing between LINE and BALE. Both clues were head-scratchers and this is from someone who is surrounded by farms where they bale (“assemble”) hay. I don’t know if this question just means that I’ve forgotten high school algebra, but I don’t know why y = 2x clues “line.” I was comfortable with “bale”, though. I suppose axis – axes is justified by the fact that they are different meanings, and different parts of speech. Enjoyable, smooth puzzle. If you plot Y = 2X on a graph, you get a straight line, as you would with any multiplier of X. Thanks. I actually knew that but I didn’t make the connection. Is there a rationale for the “(oi)-to-long a” facet of the theme? Took me far too long to get the joke on the NYT, but once I did everything fell in place pretty quickly. A groaner for sure. @Jim: Thanks for the review! You found the correct Greg Poulos, and this is indeed my first published puzzle. I’m glad to hear you enjoyed it. Thanks for stopping by. Well done and congratulations. Hope to see more from you.